While one can be found doing yoga, arranging her energy stones, and drinking chai lattes, the other is busy setting records on almond milk lattes consumed in a day, getting acrylic nails, and discovering new kawaii phone cases. 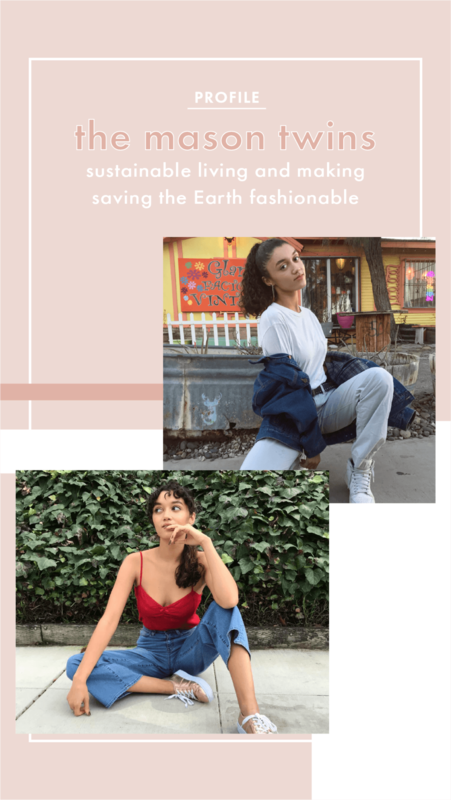 Meet Kennedy and Morgan Mason, the 19-year-old twins from Oakland, California who are reviving the conversation around sustainability in a time where fast fashion, food, and well–fast everything is becoming a staple of modern society. Often times, the demand to produce large amounts of product in a short time for very low prices involves practices that have devastating consequences for our environment. Sustainable living is a lifestyle that focuses on reducing the exhaustion of the Earth's natural resources. This lifestyle may include striving to replace whatever resources are used or limiting the consumption of products that are made using practices that don't promote sustainability. On their website, The Mason Twins, Kennedy and Morgan have something new about sustainable living every day. Their content ranges from daily deals that feature brands who practice sustainability to recommendations on locally sourced, eco-friendly restaurants around town. Their goal is to show people that sustainable living can be accessible, fun, and fashionable. Their Instagram feeds, @morganrmason and @kennedyumason, provide a small glimpse into their eco-friendly worlds. You can find fashion-forward outfits put together from thrifted items as they hop between their hometown, college, and study abroads in Europe and Asia. Their style is inspiring–the type that many strive for but think they can only achieve by spending more money. Morgan and Kennedy are proving that all your fashion hopes and dreams can be found right in your local thrift stores. I reached out to the Mason twins to talk more about the brand they're building and the message behind it. As young leaders who are using the creative world to leverage their voices, they're making waves instead of riding them. TMT, to us, is a revitalization of sustainable living. A mix of aesthetics, antics, and activism. What led you to start The Mason Twins and when did you take the leap to do it? Sustainable living has been a part of our everyday routines since, well, forever and we wanted to make it accessible to the greater population. We think there's a stigma around it, because people think it's only for hippies or crunchy California kids. We wanted to make TMT a model of sustainable living in a stylish and modern way. Tell us more about sustainable living. What is it, and how can the average gal practice it in her daily life? Start small! Sustainable living is all about changes you make that will last a lifetime. Thrift more, bring your own coffee mug to cafes, donate and resell clothes, walk more, reduce your plastic consumption, shorten your showers. All of these small things help push us in the right direction. Who does what in your duo? Are one of you more tech savvy and runs the website and the other does more of the creative work, or do you guys share all of the roles? We have specific jobs, such as website editing for Morgan and weekly publication for Kennedy. But in terms of content we share it all. What’s the next milestone you hope to reach? What does big picture success look like for you? We just want to make good content. Like, build an extensive knowledge base for the greater good. Long term success is creating a career from TMT. What has been your favorite part about building this brand? Meeting people! This industry is full of amazing curators and creators who are all trying to work towards the same goal. We love building a community with TMT. Scheduling and keeping up with our busy content calendar can be difficult, but it's the only way to get it done! Can you give some advice to the young creatives just getting started? Content is king, just keep uploading and posting!!! To keep up with Morgan and Kennedy, make sure you follow them on social media and check out their website! Sign up with your email address to get exclusive access to discounts, freebies, and more!